HE’S got every right to be showboating around the Med. Tottenham star Dele Alli has been spotted soaking up the sun in Ibiza. 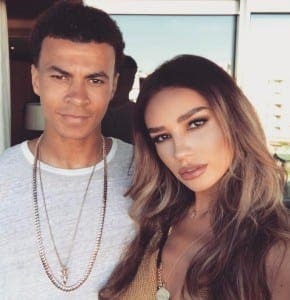 Alli, 20, whose team came second in the Premier League this year, was seen playing in the sea with girlfriend Ruby Mae, 22, before devouring a plate of sushi on the beach. The loved up pair were joined on the party island by fellow Spurs stars Kieran Trippier, 26 and goalkeeper Michel Vorm, 33. Both Vorm and Trippier were joined by their wives, with the latter also bringing along his daughter Charlotte. The holiday came days before Spurs sealed second spot in a 2-1 victory against Manchester United in the last ever game at White Hart Lane.